Simon Cowell's Syco Entertainment production company is to co-produce a film adaptation of The Fifth Beatle, Vivek Tiwary's graphic novel based on the life of Beatles manager Brian Epstein. The screenplay, written by Tiwary, is an adaptation of his graphic novel that recounts how Epstein discovered the Beatles in a cellar in Liverpool and guided them to worldwide success. Tiwary is co-producing and writing the screenplay for the film. The Fifth Beatle, published in November 2013, recounts Epstein's discovery of The Beatles at Liverpool's Cavern Club and their subsequent rise to global fame. The book spent several weeks on the New York Times bestseller list. Following lengthy negotiations Tiwary gained approval from Apple Corps and Sony/ATV to use Lennon-McCartney songs in the film. Twelve songs have currently been given permission for use: Help!, You Never Give Me Your Money, Girl, You've Got To Hide Your Love Away, All You Need Is Love, A Day In The Life, A Hard Day's Night, Sgt Pepper's Lonely Hearts Club Band, Yesterday, Strawberry Fields Forever, Eleanor Rigby and Come Together. Cannes, May 15 – Prolific independent entertainment studio IM Global, acclaimed writer Vivek J. Tiwary and Simon Cowell‘s Syco Entertainment have announced they will partner to co-produce the feature film version of THE FIFTH BEATLE. The screenplay, written by Tiwary, is an adaptation of his acclaimed graphic novel based on the life of Beatles’ manager Brian Epstein. 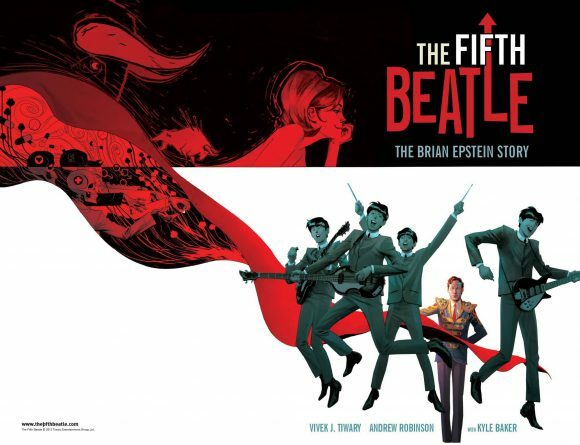 THE FIFTH BEATLE is a New York Times #1 best-selling graphic novel that recounts the true story of Brian Epstein, the brilliant visionary who discovered the Beatles in a cellar in Liverpool and guided them to unimaginable success. But it’s also the story of how Epstein, of whom Paul McCartney said, "if anyone was the fifth Beatle, it was Brian," overcame seemingly insurmountable odds and personal demons while bringing the Beatles to the world’s attention and kicking off a cultural Revolution in the process. Tiwary, Cowell and IM Global Founder and CEO Stuart Ford will serve as producers, and have already secured an unprecedented agreement with Sony/ATV Publishing for the use of Beatles music to be used in the film. IM Global President of Production Matt Jackson, President of IM Global Music David Schulhof, and Syco Entertainment's Head of Film Adam Milano will serve as executive producers. The producers also anticipate bringing a director onboard shortly. Said Tiwary, “The mission of 'The Fifth Beatle' has always been to sing the unsung story of Brian Epstein – the brilliant and inspiring visionary behind the Beatles – so I am thrilled to expand his legacy Into film. And to be partnering with a brilliant self-made boy from Liverpool and a game-changing music impresario – I'm certain Brian would be pleased!" Said Ford, “Vivek has written a powerful, vibrant screenplay about one of the most colorful and heartbreaking stories in rock'n'roll history. I am proud and incredibly excited to launch into putting the film together with Vivek, Simon and the rest of the team." Said Cowell, "I have always been fascinated by Brian Epstein – and his story. He played a huge role in The Beatles incredible success – and, I believe, remains the most talented manager ever. Yet his story has never been fully told. Also, like everyone across the world, I have so much respect for The Beatles and their music. So to be given the chance to be involved in this project was one I just could not pass up." Tiwary wrote the graphic novel, which was published by Dark Horse Comics, with art created by award-winning artists Andrew C. Robinson and Kyle Baker. THE FIFTH BEATLE has won many major literary awards, including the Will Eisner Comic Industry Award (the comics industry's Academy Award) and two Harvey Awards (the comics industry's Golden Globes), including Best Original Graphic Album. It was named a Lambda Literary Award Finalist for Best LGBT Graphic Novel, and has been added to The Rock and Roll Hall of Fame's Library and Archives Permanent Collection.